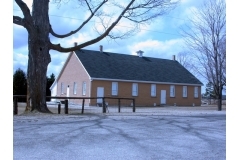 The Spring Creek Old Order Mennonite Meetinghouse is located in at 9596 Concession 6, one km south of Highway 89, five km east of Mount Forest. During the early 1960s, leaders within the Old Order Mennonite community visited the Mount Forest area to investigate the possibility of settling there. Urban areas of Waterloo County were expanding into the surrounding Old Order community, and the cost of agricultural land there was rising. In 1964 two families purchased farms in the area, despite some opposition within the community toward moving away from Waterloo County. Amsey Bearinger and family were first to move to the Mount Forest area in 1967, and during the next few years, several more families joined them. By 1972, around 15 families had moved to the area. During these first few years, a leader from the Waterloo County Old Order churches would visit the new settlement every seven weeks to hold church services, and then every four weeks as the community grew. In the summer of 1972 the Spring Creek meetinghouse was erected. In 1985 an addition was built, expanding the meetinghouse by 3 metres (10 feet) in the width and 5.5 meters (18 feet) in the length. The first ordination in the Mount Forest area was for Melvin Sauder as Deacon on 29 November 1972. As is the practice in Old Order churches, he was ordained by lot from within the congregation. Ordained persons are not paid for their church service. Over the years as the Old Order Mennonite community in the Mount Forest area has expanded, several new congregations have formed (including Cedarview, Westdale, and Riverdale). Deacons and ministers from the Spring Creek congregation have often served at these younger congregations in addition to their duties at Spring Creek, and some have transferred their services to the new congregation, depending on the situation. No official membership transfer as such takes place among Old Order Mennonite congregations because people automatically "belong to" the congregation whose meetinghouse is closest to their home. The Spring Creek congregation has not been without its share of tragedy. One of the first deaths in the congregation was that of ten-year-old Noah Frey, who was killed on Highway 89 in the summer of 1973. A year later, his 18-year-old brother, Ephraim, was the victim of a drowning accident; Ephraim had just been baptized into the church the morning of his death. In 2004, the number of families in the Spring Creek district was around 50. An accurate count of "members" is not always available because Old Order Mennonites think of themselves as members of the church at large and not just the immediate congregation. Visitors, please respect their privacy and way of life by not taking pictures of them.